Ramen. Ah, Ramen. Eating ramen is my good friend Mr. Dogz's absolute favorite thing in the world to do immediately behind swiping right on Tinder or Bumble. The time that passed between me saying "wanna get some ramen tonight?" and "YES!" was somewhere between zero and negative three seconds. 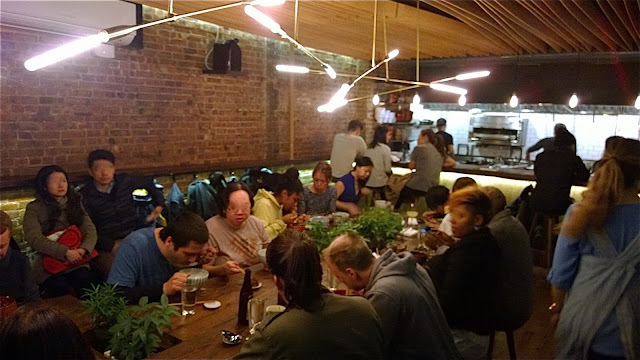 Had I known how close this place was to the E train, I might not have driven, but we found a spot a few blocks away and made our way to the almost-hidden restaurant. Actually, we passed it once without even knowing. 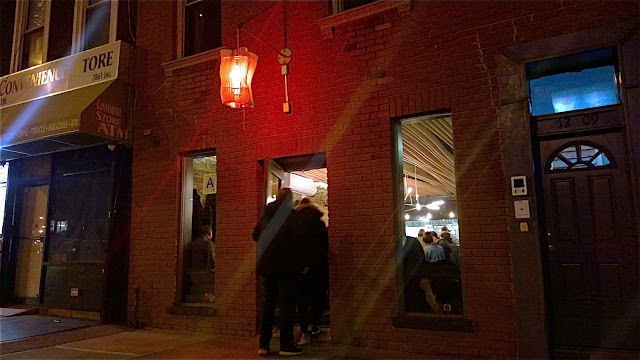 The second we walked into Mu Ramen, the Michelin-recognized soup spot from ex-Per Se chef Joshua Smookler that used to be a pop-up spot, we knew that we were in for a wait. The benches lining the walls were full and every one of the maybe 20 seats at both the bar and single long communal table was taken. It was 7-ish. Dogz and I had about a forty minute wait ahead of us, and we spent it down the block at the huge beer hall, Bierocracy. The group of three that walked in at the same time that we did were told by the hostess that they'd be waiting around two hours. I assume that they either followed us next door or took a nap on the sidewalk. There really wasn't a third option. As I said, everyone sits at a long table. If you have any thoughts of a private conversation, banish them or accept the fact that no one is listening to stories about your dating life. And in truth, I was too ensconced in how good the food was to care to listen to anything that my neighbors had to say. Indeed, the close quarters almost created a level of anonymity. Oh, did I fail to mention how good Mu Ramen is? It's good. Really, really good. Mu Ramen's menu is small. Very small. Five "treats" and four ramens to choose from. I appreciate that. I'm always uncomfortable around a phone book menu. There's no way that the chefs can be an expert at a hundred dishes. But ten? Ten they can be experts at (and they were). We shared a treat, the Okonomiyaki, a scallion cornmeal pancake topped with smoked trout, corn, roe, and a maple syrup. It was amazing. Amazing. 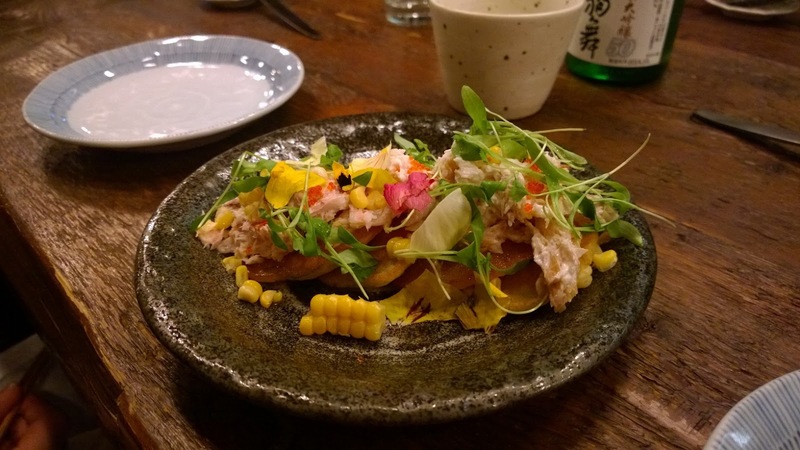 The smoked fish somewhat dominated the dish, pushing out the pancake, but if you accept that the point is actually to eat the fish and view the pancake not as the main part, but instead as something to add depth to the trout, then you'll love this. 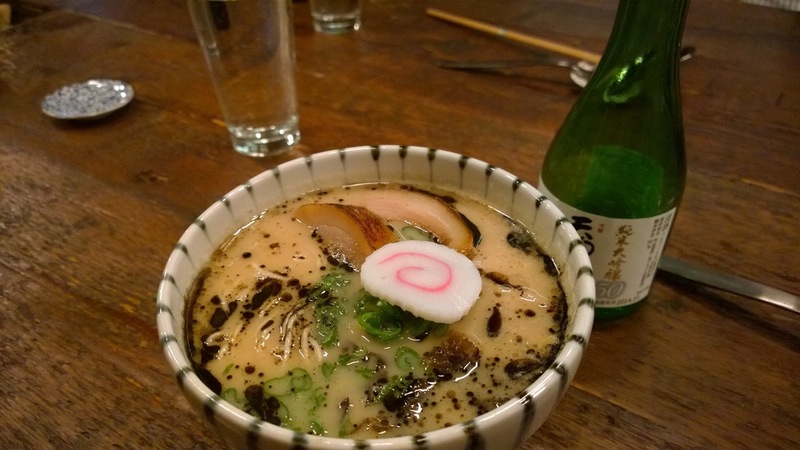 Dogz ordered the Tonkotsu 2.0 ramen. This soup had an extremely thick, pork based broth that had a intense mushroom presence. I hesitate to ever type the word "umami" (and "flavorful") for a reason I can't fully articulate. But umami the word that simply must be used. The texture was like drinking silk. Flavorful, mushroomed silk... though, according to those in the know, there is no mushroom. 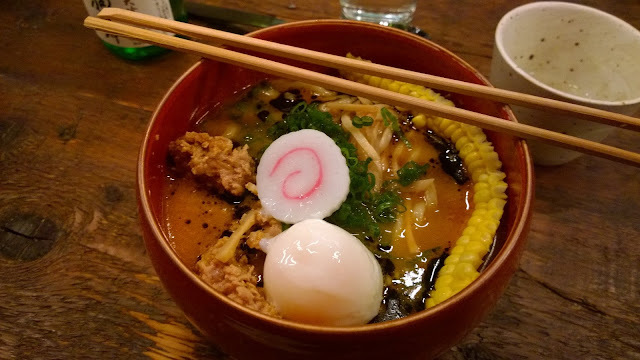 The silk was topped with pork, a seasoned egg, and scallion and might have been the best ramen I've ever had. Dogz, who fancies himself quite the ramen enthusiast, was blown away. My bowl of ramen was the Spicy Miso. I was mildly concerned that this would be a less robust soup than I was hoping for, but this was without merit. It was only half miso and quite robust. The other half was pork based. I did order an extra topping of Onsen Tamago (a soft boiled egg) because I've never met a ramen that wasn't given a little boost by loose runny eggs. Don't let the spicy part concern you. It was far from hot. The strip of corn and the deep fried pork was a nice touch and kept everything nice and rich. The ramens here are about $16 for a base bowl, with extras at about $2 each. Our split bottle of sake, a split appetizer, and two ramens came to $48 each with tax and tip. Are there cheaper ramen places? Yes. Is it worth it? Oh yes. But go with one friend, not two or three. Not only is the wait going to be oppressively long, but the table is wide enough that you'll have trouble talking if and when your mouth isn't filled with soup. Admittedly, this will not be very much of the time. If I ask you to think about Red Hook, Brooklyn, the odds are that you're going to think about the Fairway and its immediate area. Little shops, a winery, some restaurants, artists, and rowhomes that sell for way more than you'd expect given that this is a flood zone. In the summer, girls in sundresses ride bicycles with baskets as people wander the cobblestone lanes eating frozen key lime pie pops, enjoying the sweet smell of the ocean. 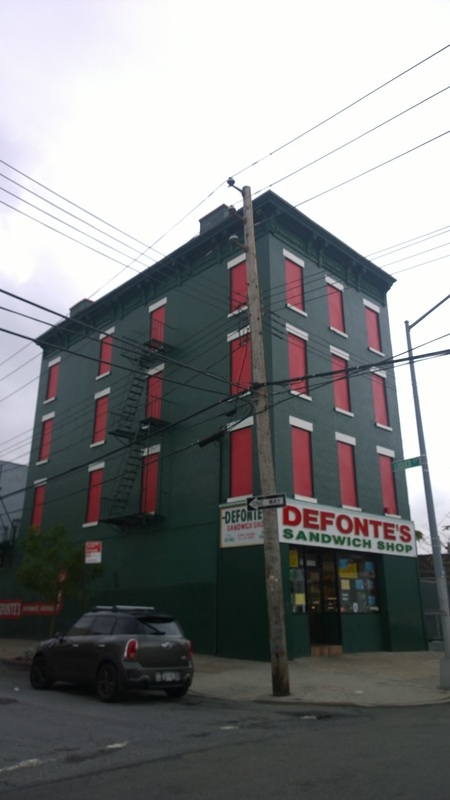 But there is a second Red Hook just a few blocks away towards the BQE. Housing projects, taxi repair depots, and a liquor store whose Yelp review states, without a hint of sarcasm: "Out of all the bulletproof liquor stores I've ever been to in Brooklyn this is by far the cleanest..." This is pre-gentrification Red Hook and this is where Defonte's exists; on the ground floor of what would otherwise look like a cutseyfied abandoned brownstone. Inside Defonte's, the vintage theme remains as you walk back in time, but if the exterior hasn't clued you in, there's nothing cozy about it. There are no tables. You can either eat on that ledge with the napkin holder or someplace else. They could care less either way, as long as you don't block the other customers, of which there will be plenty. No, they don't take credit cards. See the sign? Cash only. No cash? There's an ATM. Don't be late because they close at 4PM and when they run out of something for the day, they don't make more. I arrived at 3:30 once and they were stripped nakeder than a Trader Joe's on the eve of a hurricane. "We have whatever is in these six trays" the guy told said. I told him I was thinking about getting roast beef. His reply? "Think about something else." When you've been around for nearly a century, you're clearly doing something right. Despite being featured on the Food Network and in just about every tour guide, there's clearly a good chunk of regulars that stop by for lunch. The staff's Brooklyn accents are un-ironic but friendly. Even the wiseguy with the roast beef comment said it in a chipper way. 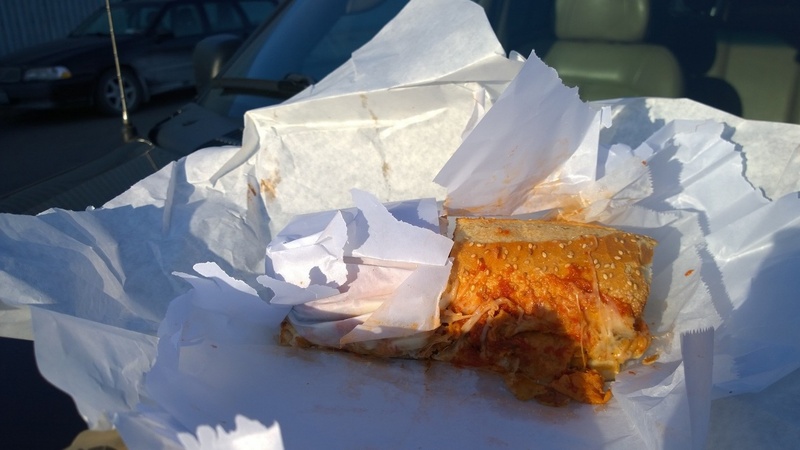 In subsequent trips (they're on the way to Ikea) I picked up a Cuban sandwich and I had to try their Red Hook sandwich, since that's where they are. 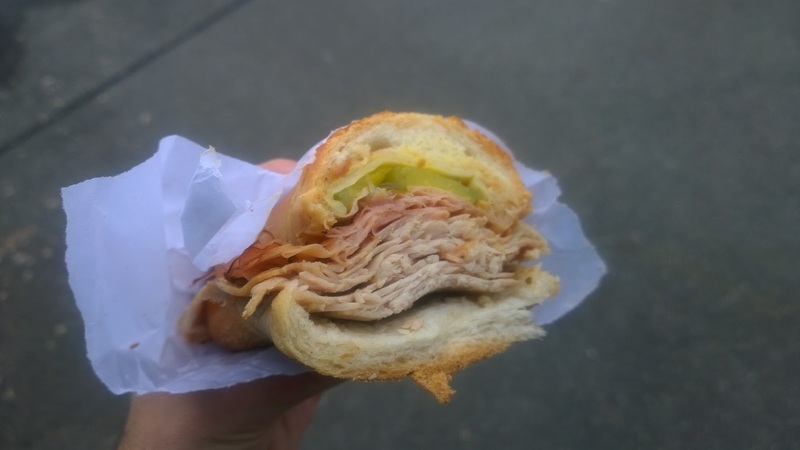 The Cuban sandwich adds about an inch of roast pork to the traditional ham, Swiss cheese, and pickle. It was delicious, but I would have liked a bit more cheese and the pork was a little dry. Not overly so, but a tiny bit. No regrets though. And bonus? You can eat it in the car. The Red Hook sandwich is a breaded chicken cutlet with bacon, ham, cheddar, lettuce, tomato, and mayo. It's greasier than the Cuban, but fantastic. There are a hundred more sandwiches to go. Luckily, I seem to be going to Ikea weekly. 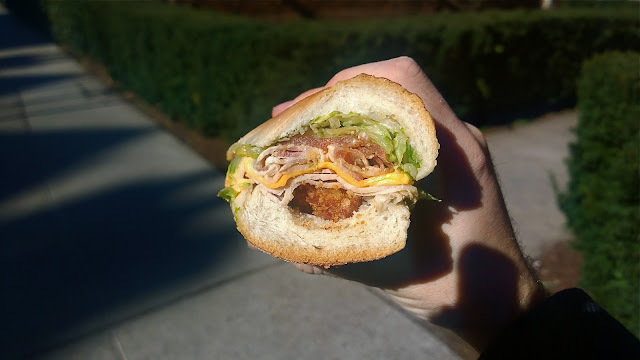 One thing that separates these sandwiches from just about anywhere else is the bread. No, it's not some artisinal roll made from organic, free range wheat. It's just good. The bread is sweet and perfect to bite into. It's firm, but not crumbly and crusty; soft, but not chewy. You don't fight the bread trying to take a bite and it doesn't bite you back with mouth slicing splinters. It just gets the job done well. Iconic NYC restaurants run the gamut of prices. The Lemon Ice King of Corona is very cheap. Peter Lugers is not. The Second Avenue Deli isn't "expensive" but it is outrageously overpriced. 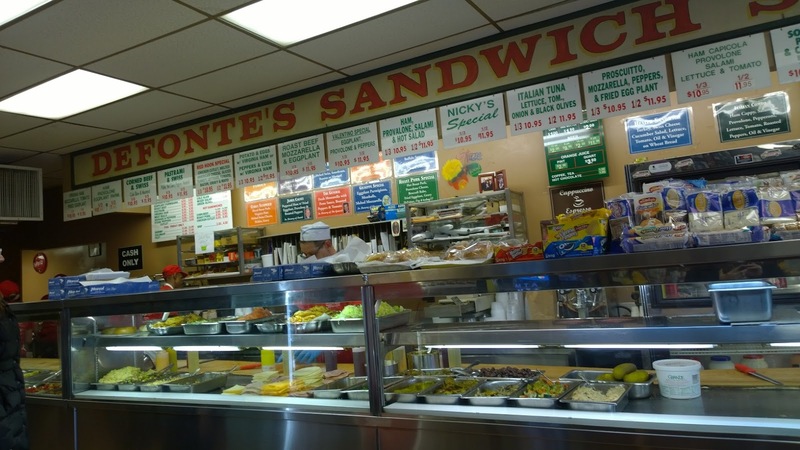 Defonte's is none of these. They make sandwiches that aren't gimmicky, so they aren't going to put you in the poorhouse, but the sandwiches will can be $12 for a small. But the small is about ten inches long. You can get a larger one for a few bucks more, or go to town with a 6-footer for $140. By the way, there is a second Defonte's on Staten Island. There used to be a Defonte's in Manhattan in the Gramercy Park area, but the building is going to be knocked down, so it's gone.